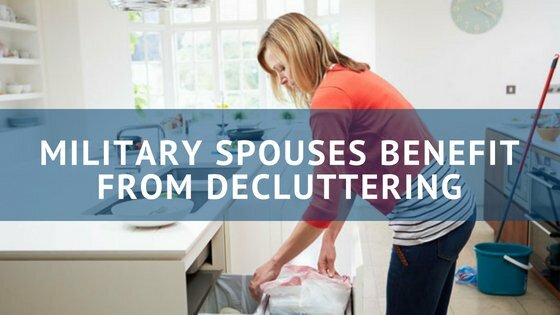 We can all benefit from decluttering, but military spouses who have an undercurrent of stress in their daily life can benefit even more than others. Getting organized at home allows you to focus on what matters. A clutter-free life makes PCSing simpler and allows you to work on your personal and professional goals and make forward movement towards them. Many of us begin getting organized at home with spring cleaning but then feel as if we need to redo the entire process as summer comes around and the kids have once again cluttered the house with school work and art projects. On top of that, it’s PCS season. So whether or not you’re moving this year, pretend you are, and work on decluttering. It’s amazing what happens when you take a laundry basket and walk around your house getting rid of things that aren’t aligned with bettering your health, increasing your wealth, or achieving closer relationships. I organize their summer clothing so that we can focus on making laundry days simpler. Doing laundry for a military family is hard. We have our own clothing, our husband’s work clothes, workout clothes, the kids’ clothes, sporting gear—it’s a lot! I find that what helps me the most with laundry is purging. I’m less inspired to put clothes away when our shelves are overstuffed and we can live for too long without washing clothes. Once I purge the kids’ closets (and my own! ), I’m much more motivated. I also find that listening to a podcast while I’m folding laundry can be a fun way to learn something new while I’m getting tasks done. Figure out what works best for you and start implementing it regularly. In a recent coaching session with a military spouse, we chatted about decluttering strategies before her upcoming PCS (permanent change of station). I suggested she start by choosing one area of her home to get organized and prepare first. Day one was designated for purging and day two was for organizing. We landed on the topic of “mystery cords,” and I couldn’t help but laugh and admit that I still have a drawer full of them. It was a proud moment when I heard her utter the words, “You know what, I’m just going to throw mine out!” She was clearly mentally prepared for her upcoming move. But more than that, there was something so freeing in her voice that screamed, “I’m telling the universe that I’m ready for a new chapter in my life.” Her excitement was contagious! Even if you aren’t making any big changes this summer, as you declutter and get your home organized, pay attention to any stuck energy that surrounds you in your home or mental drains that you can let go of. Purge your house and mind and make the conscious decision to just enjoy your summer months. If you’re dealing with too much clutter and want to learn a simple system for decluttering, sign up for my June webinar to learn all about my 21-day Decluttering Challenge. Even if you can’t make the live webinar, I’ll send you a recording of it! Share the post "Military Spouses Benefit From Decluttering"